I’m working on a project. It’s rather large and keeps growing the further I get into it. Since I might not complete it for quite a while, I thought I might share parts of it here with you. 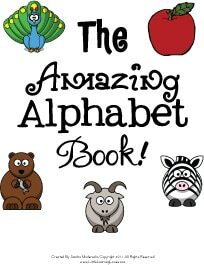 Part one of this project is what I’m calling The Amazing Alphabet Book. This week, I’ll be sharing activities for the letter A. Come back each day for a different fun printable. And please leave a comment letting me know what you think of them. I’d love to have your input and advise! Today’s activity asks kids to find all the A’s and a’s in a jumble of letters printed in all different fun and funky fonts. My kids loved the look of this sheet and really enjoyed doing it. They asked for one for every letter! I hope it’s as much of a hit with your kids as it was with mine.